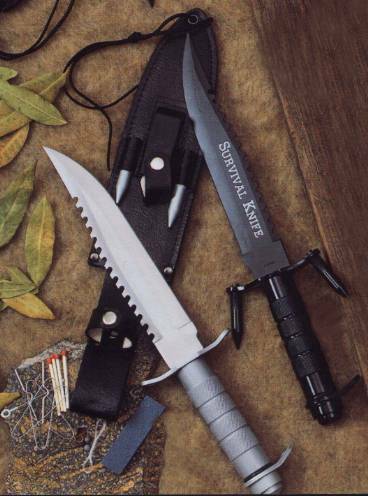 This is a great survival knife. Features a 9" 440 stainless steel saw back blade. Steel handle with hand protectors and a water-tight o-ring sealed end cap containing a survival kit. Kit includes a compass, wire snare, fishing line with hooks and sinkers, matches and needle. Has a black leather sheath with leg tie, belt loop and pockets for hand protectors and sharpening stone. Overall length is 14". Choice of black or silver.